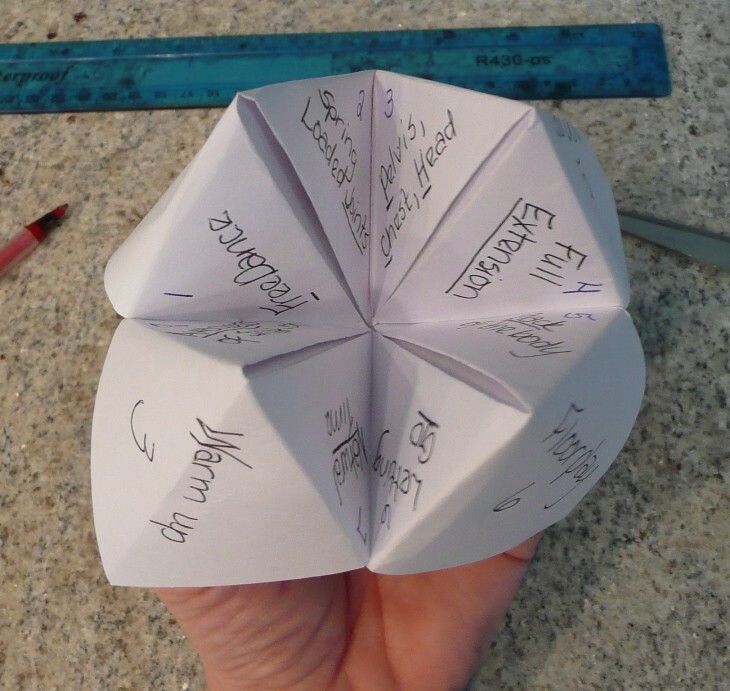 In my last post I told you how I was recently reminded of the Cootie Catcher. I explained how you can make your own. Did you? What did you use it for? Well, I also mentioned that I would be using mine for picking a focus and an intent for Nia class. Well, I used it today and I liked it. It worked. 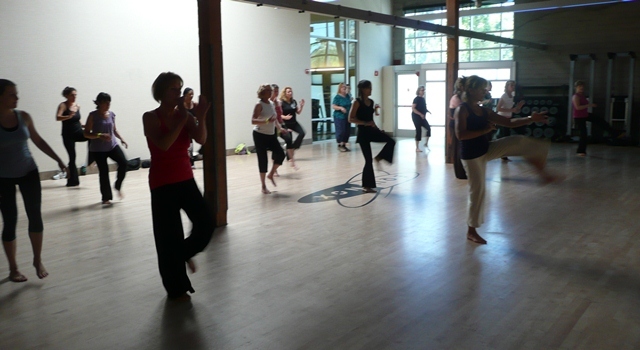 In Nia we set a focus and an intent for each class, which allows us so many different things. It could help us move differently to a familiar routine, it could allow us to help work out some kinks in the body and mind, it can do many things. It is a powerful tool in the Nia tool box. Most often I ask my students if they have anything they would like to focus on. Then we go from there deciding an intent. One of the most requested focuses is shoulders. So many of us hold tension in our shoulders. Rarely is there a time when no one has something they want to focus on, but I thought it would be fun to mix it up giving us an alternative for picking the focus of the class. Plus I thought it would be a good way to get some focuses in use that we don’t use that often. So I made a cootie catcher to assist us. I wrote four of the seven Nia Class cycles on the outside. I used the number of the cycle. 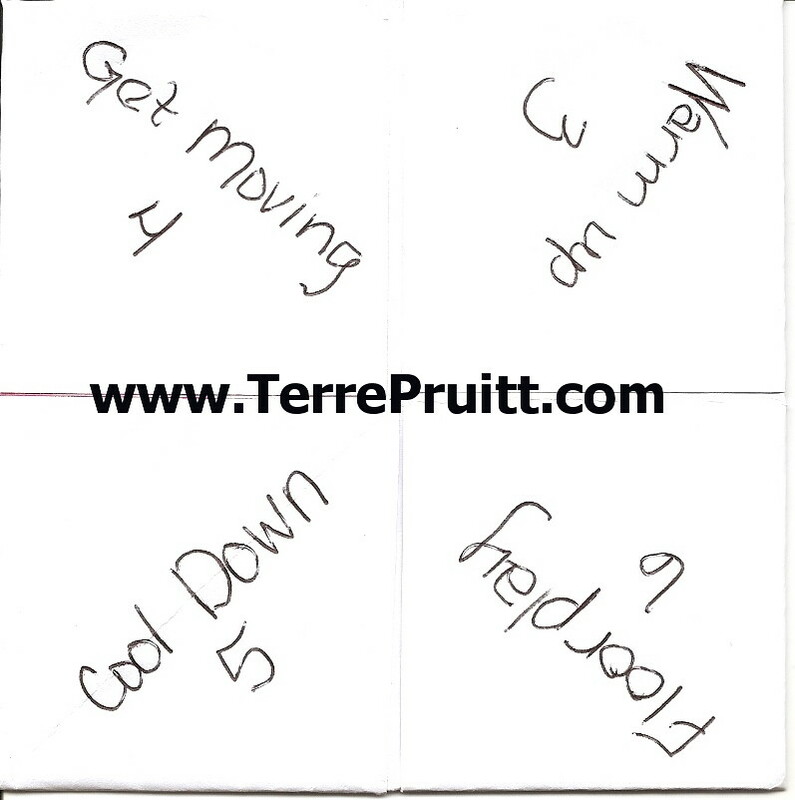 Warm-up is cycle 3, Get Moving is cycle 4, Cool Down is cycle 5, and Floorplay is cycle 6. I could have just used numbers but I wanted to remind people that Nia has cycles. I wish I could have used all seven. So we have someone pick the cycle, then we open and close the catcher that number of times. Then someone picks a focus or I might have them choose a number . . . that way they won’t really know what focus they are picking. Ha, I will probably do it both ways. Anyway . . .we now have our focus. Then the catcher is opened and closed as many times as the corresponding number. Then someone picks another number and we open that triangle and read the intent that is behind it and that is our intent for the class. Today in class we picked Natural Time . . . to empower us to connect with our body. NICE! Each focus can work nicely with each intent. So no matter what combination is picked it will work. You may notice the underlining on the focuses (Joints is underlined, Extension is underlined), originally I was going to use the words, spelling them out to open and close the catcher, but I decided to go with the numbers. But again, I might try that way, too. There are so many ways you can do it. That is one thing that makes it so fun! There are many ways we can decide on a focus and intent, this is just one. 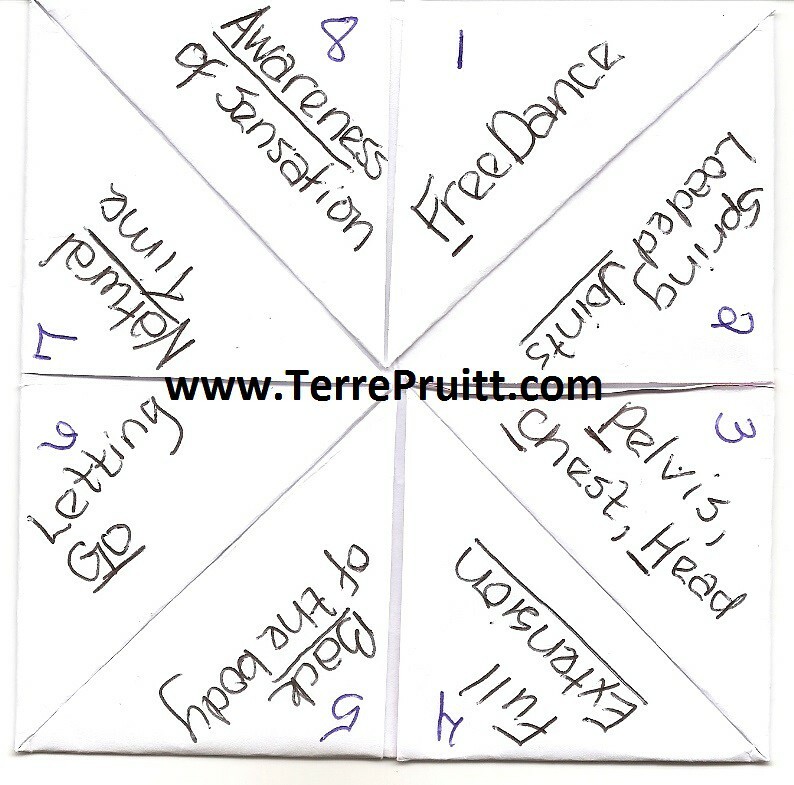 If you are going to make one to use to help with a focus and intent you need FOUR things for the outside (that is where I put the cycles). Then you need EIGHT focuses and EIGHT intents. So that would be the same formula for anything you are going to use the catcher for. Four, eight, eight. I would love to make more and have all kinds of different focuses and intents. 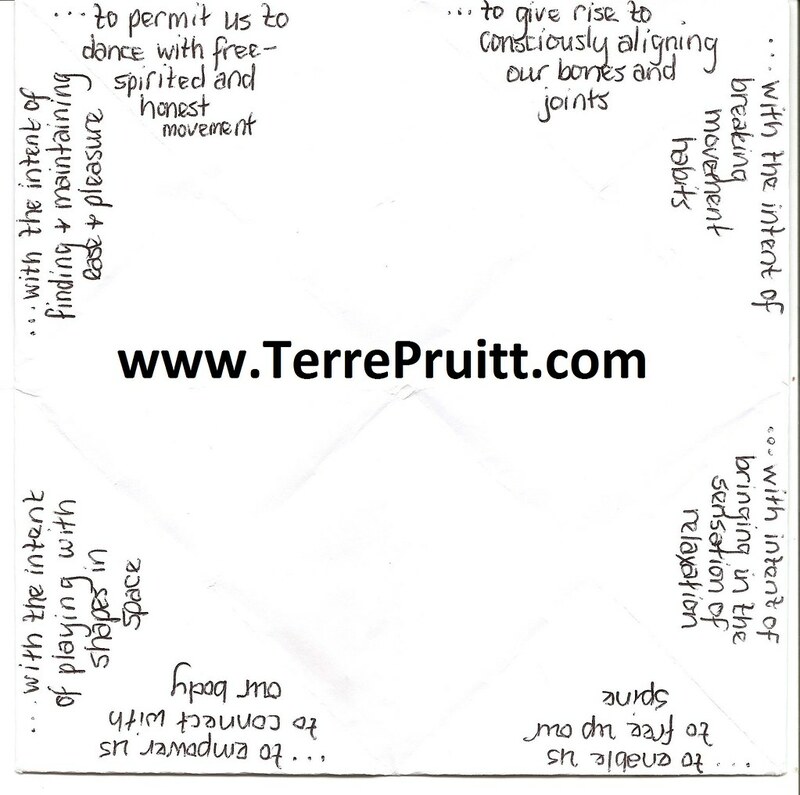 So, you Nia teachers and Nia students, share with me your favorite focus and intent! I know – well, I am pretty confident that I have mentioned before in a blog post that I don’t think of myself as teaching people Nia. Even though I say I teach Nia, I usually prefer to say I lead Nia. I wish I could find that post because I would like to check what I said exactly because I am feeling a bit different these days. Or maybe I have it clarified in my mind better. I believe I said that I don’t like to say I teach Nia because I feel that a dance teacher is one that demonstrates the steps and then has the student try to do them while the teacher watches. Then maybe the teacher demonstrates again and the student does it again and then maybe there is some adjusting done by the teacher. Or even in a group dance class setting the move is done over and over until it is somewhat learned and then the next move is added on. Sometimes there is a sequence of moves that is demonstrated then practiced over a few times and then a new sequence added on. That is what I think of as teaching dance. So in THAT way I don’t teach Nia, but I DO teach Nia. I do not show the move then have the students practice it over and over before we dance it, but sometimes when the song allows we do a preview and practice. It could be that the song has a long introduction in which there is no specific choreography and in that time we demo a move. While I might not tell a participant in particular a way to tweak the move I will look out into my class and see something that could use tweaking so I might say or even do something that I hope will lead to a change. Say, we are doing a move using our toe and I look out and see someone using their heel, I might suggest using the toe like squashing a bug or testing the water (depends on what we are doing). So in essence I hope to teach the students that we are using our toe. I teach the move as we are doing it as opposed to the aforementioned way. IN addition, I like to share things about Nia while we are dancing. Sometimes I talk about how Nia incorporates the BMES (Body, Mind, Emotion, and Spirit) I might explain Nia’s Five Sensations while we are moving on the floor. Allowing the Nia students to be reminded of them and possibly use them in the floorplay. I often remind the Nia class about Natural Time letting them know they are free to move through the movement/choreography in their body’s own natural way and timing. Sometimes this is actually part of the song and if not people are always encouraged to move in this way. So, I take it back if I said — as I believe I did — I don’t like to say I teach Nia, because I do teach Nia. But I don’t teach it as if it were a dance, because it is not just a dance. While we do dance, Nia is so much more. Maybe I should say I lead people through Nia Routines and I teach Nia? 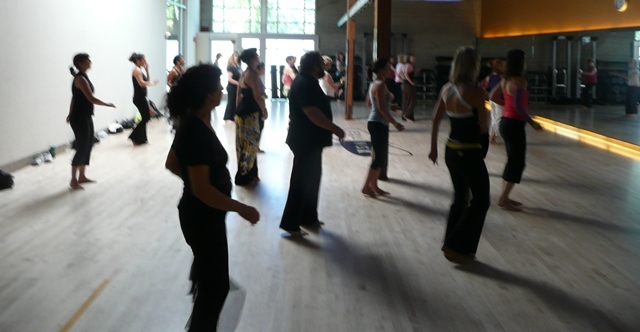 Have you ever taken a dance class like I describe – the demo-do-type? Do you see the difference between two? While I was doing a Nia DVD today, I kept sensing some discomfort in my back. I have a spot, a muscle I guess, that sometimes becomes “whiny”. I think that particular spot on my back, directly next to my backbone to the right, right at the edge of my shoulder-blade, holds all of my stress and tension. When it came to the floorplay exercise portion of the Nia workout I was focused on my back. It was really getting my attention. I have had a student assisting me with my toe/foot and she often says she is “releasing it”. I wondered if I could touch my back and “release” it. So I did. I pressed on the spot that was speaking to me so loudly. It seemed to help. I believe in the power of touch. But since it is a place on my back that is needing touch it is not easy for me to get the entire area. While I was laying on the floor I was wishing I had a tennis ball to roll on. Have you ever heard that? Using a tennis ball to massage your back. I had a friend who mentioned to me that she was told to put a couple of tennis balls in a sock and roll on them. You can roll on them against a wall or on the floor, whichever is most comfortable for you. I had heard to use the balls, but I hadn’t heard of the sock until she mentioned it. The tennis balls could be used to massage more than just your back, you could roll it under your legs or on your arms. I don’t have tennis ball, but I do have a rather large “super ball”. I don’t know if that is what it is called, but that is what I remember we used to call them when I was young. You know those balls that bounce really well? 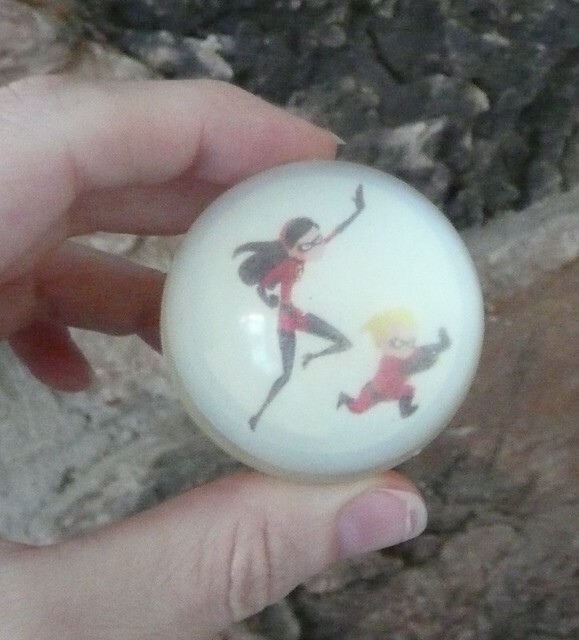 It is a “The Incredibles” ball. It is kind of old so it is yellowed. It is also really hard. Much more hard than a tennis ball and a little smaller. I remembered that the last time I saw it I had used it for my foot and it was in the entertainment center. How convenient? It was right there. YAY! At first I tried using it while laying on the floor. That didn’t work so well because it was difficult to roll on the floor without using my elbows which, in doing so, caused me to rise away from the ball. Plus the ball is really hard. So I used it with the wall. I leaned on the ball while it was on the wall. WOW! Awesome. I think the muscle that gets annoyed is small and there was almost a clicking sound as the ball rolled over it. That is how tight and grumpy it was. As I mentioned, I had used the ball on my feet before, it is a great foot massagerm just rolling it under my foot, but I hadn’t used it on my back. Glad I thought of that. So what do you think? Have you heard of using tennis balls to massage sore muscles? Have you ever tried it? Do you use the sock method? Oh do tell, I would love to hear about it. It could definitely help with DOMS. What do you say? Lyrics Gone Wrong . . . I had entertained the idea of doing this once a month, but after the second month I ran out of songs to play with. Interesting Picture – Marilyn Monroe Albert Einstein . . . I LOVE optical illusions and this one is a doosey. Hummingbird Tongues . . . they still fascinate me and I am still surprising people with the fact that the birds have tongues and use them more than the beak is a straw. And usually they tongues dart in and out so fast it is a rare treat to catch it out for a picture. Yay! A Poem Says A Lot . . . Fabulous! We Have Come To Be Danced . . .
Nia Belt System . . . Before you can move onto the next belt they say a year must pass. You do not have to get involved. It is a great workout without being involved with the belts. The belt system only comes into play if you care to get that involved in Nia. Nia’s belts mimic some Martial Arts; white, green, blue, brown, black. I am learning so much with my White Belt, I can see myself waiting at least another year before I move onto the next belt. There is so much to learn and enjoy in each belt, I am not in a hurry. Say: “I Am Wonderful” . . . I like to say this, I like to hear this song. I like to remind people to go to iTunes each week to download the free song. A Brief Look At Nia . . . still excited to share Nia with people. It is a great body-mind practice and a workout that can make you sweat yet not really feel like exercise. 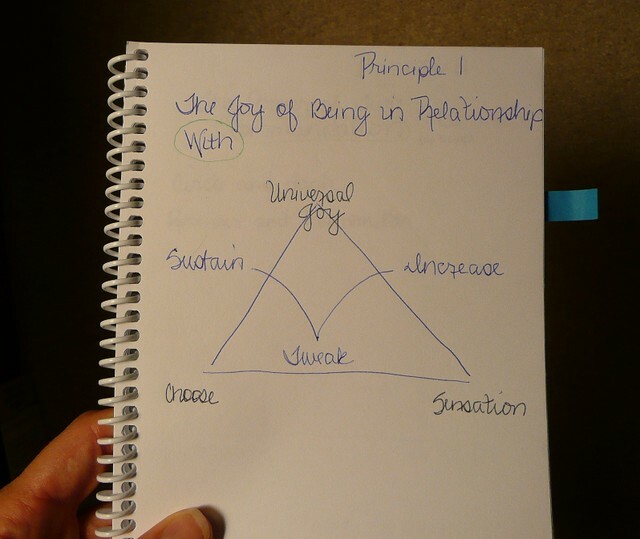 It is learning to follow the body’s way. Wrapping Tips . . . WHAT? I was shocked that everyone did not read my blog. On Christmas Day and the day after the bags and bags and bags and bags of wrapping trash that I saw on the curbs just blew my mind. In this day and in these times, I was just utterly flabbergasted that people don’t re-use the wrappings. It amazed and saddened me. My Favorite Mugs . . . so I found out that not everyone got my little joke. Ya know, back in the day (what day, I don’t know), they used to call faces mugs . . . get it now? The Seven Cycles Of A Nia Workout . . . The workout has cycles, somewhat like Jazzercise. I like to share this aspect of Nia so people have an idea of what a workout class will be like. We set a focus and an intent, step in, warm up and move all the way through the cycles to the floor, and then we step out. Well, thank you so much for joining me on my blog. I hope that you continue to read, I hope you enjoy and learn. I learn from your comments so keep them coming. Thank you for a great year. Here is to the NewYear. 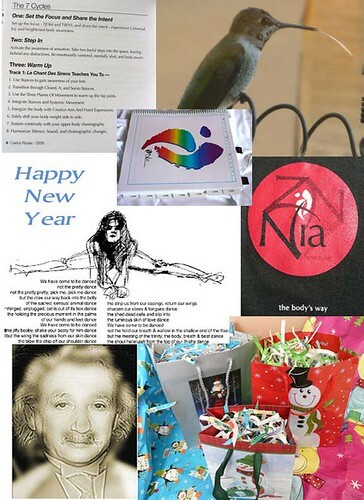 But . . .before we jump into the New Year, share with me what your favorite post from my blog was? AND/OR give me ideas on what you would like to see posted in the New Year.